A French Croissant is instantly recognizable with its crescent shape that is golden brown and so buttery crisp and flaky. When you cut into one you'll find the dough has formed a beautiful honeycomb design with a texture that's wonderfully soft. Yes, you can make them at home. While it's a little time consuming, because of all the rest times, it's worth every minute. And once you master the basic dough, you can make plain Croissants, Chocolate Croissants (pain au chocolat), Danish Pastries, as well as a host of other sweet and savory pastries. And Croissants that are a few days old can be used to make Almond Croissants (croissants aux amandes). I learned how to make Croissants when I took a two day hands-on class at the San Francisco Baking Institute (SFBI). Our wonderful instructor showed us all the ins and outs of making a great Croissant and we were able to make batch after batch to learn the craft. The recipe I give you here is from the SFBI, although I have modified it for the home baker. And if you're ever in the Bay Area I highly recommend this baking school. 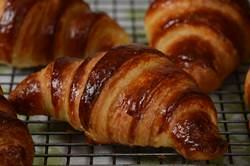 A Croissant dough is a laminated dough. It's similar to puff pastry only it contains yeast. That means you have two layers of slightly sweet dough with a layer of butter in between. As you may be aware, once the butter is encased in the dough it is rolled and folded into thirds, three times, with resting times in the refrigerator between the second and third fold. This does take several hours and it's important not to rush the process. Croissants are not that difficult to make. It's really all about precision and temperature. You must roll the dough to the required length and width and the temperature of the dough needs to stay cool. You will find that if the dough isn't rolled thin enough your Croissant won't have that beautiful honeycomb interior. Instead you may have just a big hole in the center surrounded by a thick layer of dough (looks more like a dinner roll than a Croissant). Also, when rolling and/or shaping the dough, if it gets too warm the butter will melt into the dough which again will affect the texture of the baked Croissant. So if, at any time, you find your dough is getting too soft or overly sticky when rolling, then return it to the fridge until it firms up. If you're working in a very warm kitchen, I find it helpful to rub an ice pak over the counter to cool it off before you roll the dough. A few notes on ingredients. The type of butter used will affect both the flavor and texture of your Croissant. For the butter layer it's best to use a high fat unsalted butter (butter with 83% butterfat content) as it makes a flakier croissant with a more pronounced butter flavor. In the States this type of butter is normally labelled "European style" or "cultured". While we used a low protein bread flour at the SFBI, it can be hard to find so for this recipe I have used all purpose flour to make the dough. There is also a little dry malt (diastatic) powder which breaks down the starch and gives sugar for the yeast to feed on. This is especially good for doughs, like this, that have a long fermentation period. Malt powder also aids in browning and helps the Croissant have a good rise. I have used SAF Gold instant yeast in this recipe. This type of yeast is normally used by professionals as it gives a good rise, especially when making sweet breads with long fermentation periods. An added bonus is that since the grain particles are so small, you don't have to proof it first. What's great too, is that you can store it in the freezer and then just scoop out the amount you need. However, you can substitute with 10 grams (2 1/2 teaspoons) active dry yeast but I would activate the yeast in the water, with a 1/2 teaspoon of sugar, before making the dough. Homemade Croissants: In a large bowl combine the flour, yeast, sugar, and malt powder. Then stir in the salt. With your fingertips work the butter into the dry ingredients until the butter is in small pieces and coated with flour. Make a well in the center of the dry ingredients and pour in the water and milk. With a bench scraper or wooden spoon, gradually work the flour into the liquid, making sure that the dry ingredients are moistened. Then using your hands, work the dough for a minute or two to make sure all the dry ingredients are thoroughly moistened. At this point the dough will be a sticky mass. Cover the bowl loosely with plastic wrap and let it ferment for about one hour (helps to develop flavor and aroma) at room temperature (75 - 78 degrees F) (24 - 26 degrees C) . After an hour transfer the dough to a lightly floured surface and press or roll the dough into a 14 x 10 inch (35 x 25 cm) rectangle. Transfer to a lightly floured baking sheet, sprinkle the top of the dough lightly with flour, cover with plastic wrap, and place in the refrigerator for at least six hours (or overnight). About 15 minutes before you want to laminate the dough, take a sheet of parchment paper and draw a 10 x 7 inch (25 x 18 cm) rectangle on the paper. Flip the paper over. Take your cold butter and cut it into six pieces. Place the cold butter within the drawn lines on your parchment paper and enclose it in the parchment. With your rolling pin pound the cold butter to soften it a little. Then fold the parchment paper to make a 10 x 7 inch rectangle (like an envelope) and roll the butter until it fits this size. Make sure the butter is of even thickness. At this point you want the butter to be cold but still pliable. It needs to be at the same temperature as the dough. If it's too soft then place in the refrigerator for about 15 minutes. Rolling out the dough (lamination): The temperature of the dough is important when rolling it out. It is best that your kitchen is cool. However, I have found you can cool your countertop by running an ice pack over the surface before rolling. First Turn: Transfer the dough to a lightly floured surface with the sealed edges running vertical. With your rolling pin gently tap the dough and then roll the dough vertically into a 22 x 8 inch (55 x 20 cm) rectangle. Lift the dough frequently as you roll so the dough doesn't stick. Flour as necessary. Roll end to end, not side to side, making sure the dough is of even thickness. When it's at the correct length and width, fold the dough lengthwise into thirds, like you're folding a letter. Make sure the edges of the dough are straight and even. You now have your first turn. Second Turn: Rotate the dough 90 degrees so the folded edge is on your left (like the binding of a book). Repeat the process of rolling your dough to 22 x 8 inches (55 x 20 cm) and fold the dough again into thirds. This is now your second turn. Place the dough on a lightly floured baking sheet, lightly flour the top of the dough, cover with plastic wrap, and place in the refrigerator to chill one hour. Third Turn: Take the chilled dough and repeat the rolling and folding into thirds one more time. This is your third turn. Again, place your dough on a floured baking sheet, flour the top of the dough, cover, and refrigerate one hour. Shaping the Croissants: Line two baking sheets with parchment paper. Make a triangular template from a piece of hard plastic or cardboard that measures about 3 3/4 inches (9.5 cm) across the base and about 9 inches (23 cm) high. On a lightly floured surface roll your dough into a 24 x 9 inch (61 x 23 cm) rectangle. Make sure to lift the dough frequently so it doesn't stick and this also allows the dough to shrink back. Then trim the long edges of the dough with a sharp knife or pizza wheel. Use the template as a guide to cut the dough into 11 triangles. Working with one triangle at a time, hold the wide end of the triangle in one hand and using your other hand, gently run your hand down the length of the dough to lengthen it. Then place the triangle on your surface and cut a small slit in the center of the wide end of your dough. Starting at the wide end, roll the dough into a crescent shape. Do this gently as you don't want to compress the layers. Place on your baking sheet and repeat with the remaining triangles. In a small bowl whisk the egg with the egg yolks. Using a pastry brush, lightly brush the tops and sides of each croissant. Place each baking sheet in a large plastic bag and let proof for about 1 1/2 to 2 hours at room temperature (75 - 78 degrees F) (24 - 26 degrees C). You know the croissants are proofed when you gently shake your baking sheet, the croissants will wiggle. Also the croissants will be soft to the touch. Preheat your oven to 400 degrees (200 degrees C). Place your oven racks in the upper and lower thirds of your oven. Brush the Croissants again with the egg wash. Place the two baking sheets of Croissants in the preheated oven and bake 10 minutes. Rotate your baking sheet top to bottom and front to back. Reduce your oven temperature to 375 degrees F (190 degrees C) and bake for an additional 10 minutes or until golden brown and firm to the touch. Remove from oven and place on a wire rack to cool. Croissants are best the day they're made.